Shortly before setting off for the tour, the musicians, led by artistic director and chief conductor of the famous team, Volodymyr Sirenko, did a fair bit of work at home. They actively participated in a large commercial project, the international premiere of The Great Gatsby ballet, which was enthusiastically received by the audience of the Ukraina Palace. The orchestra also performed two programs at the National Philharmonic Society, which will be presented in Japan as well. Their tour of the country of the Rising Sun will take them to eight concert halls. The Ukrainian orchestra will perform jointly with famous Russian pianist Vladimir Mishchuk, winner of the Tchaikovsky Competition, who is scheduled to hold a solo concert in Kyiv on March 3, 2015. The orchestra’s Kyiv Philharmonic Society program included Sergei Prokofiev’s “classic” Symphony No. 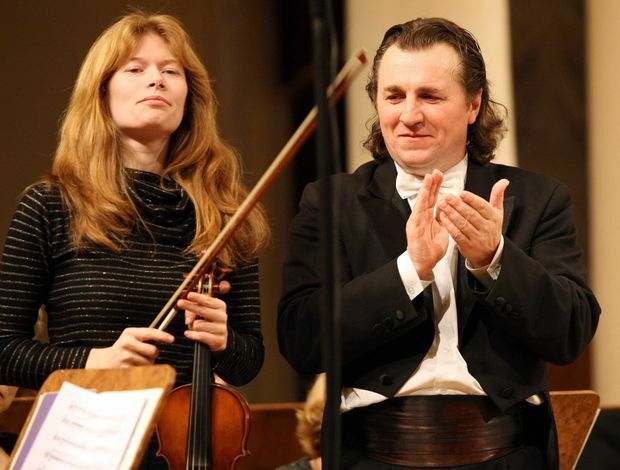 1 and Yevhen Stankovych’s Concerto-Poem for Violin and Orchestra (this work was written in 2004, and the latest performance had Bohdana Pivnenko as the soloist). The second part of the show saw the musicians performing Pyotr Tchaikovsky’s Symphony No. 5. The audiophiles were most impressed with Stankovych’s Concerto, finding it expressive, vivid, and very poetic. Incidentally, the orchestra plans to record three more violin concertos by the Ukrainian master (the composer is working on the third at the moment). Performance by 37-year-old Ukrainian pianist Oleksii Hryniuk was the centerpiece of the second evening of Japan-bound music. Accompanied by the orchestra, he played the Piano Concerto No. 3 by Sergei Rachmaninoff. The musician learned his art in Kyiv, first at the Lysenko School under Natalia Hrydnieva and then at the National Music Academy of Ukraine under Valerii Kozlov. Simultaneously, he graduated from the Royal Academy of Music in London, where he studied under its famous professor Hamish Milne. He has been living in London for years and holding concerts worldwide. His visits to his hometown are always of great interest to the public. The pianist did not fail to delight the Ukrainian audience this time as well. By the way, the Kyiv Philharmonic Society’s concerts can be seen as the “dress rehearsal” of the National Symphony Orchestra of Ukraine before going on a large-scale tour of Japan.